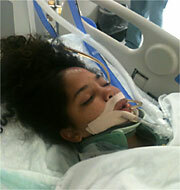 Takara Davis, after being hit by a car. But a jaywalking citation while the kid is lying there bleeding in her brain? Are you serious? What kind of self-absorbed jerk of a police officer walks to the hospital to do that job? It’s a lie because obviously it was deliberately insensitive. Why would the cop do it and why would a spokesman actually defend such inhuman conduct? I have a theory. Since no human being in his right mind would ever conduct himself this way (well, almost none), I think someone put him up to it. Like the driver of the car that hit the kid. I would bet that the driver was a cop. Or friend/relative of the cop. Or local politician. Someone with the ability to influence how the cop does his job. Because I bet there was a driver thinking about liability and being sued, as the child’s life ebbed to the edge of her world. Someone thought giving the kid a ticket would be a good idea to use in a potential civil lawsuit later, and “asked” the cop to do it. I can conceive of no other explanation. This does not excuse the cop on the scene, of course, who went ahead and did this. I don’t care if it was the Chief of Police that was behind the wheel of the car that hit the kid. You have to act like a human first. And here’s the thing: This hair-brained ticket idea likely won’t even work as a means of defending against a civil suit, and might well backfire. For a ticket is merely an accusation. You get a chance to fight tickets. To plead not guilty. The fact that someone is accused of something isn’t admissible in any court that I know of. So there will be a trial if the child doesn’t think she jaywalked. Assuming, of course, she is capable of conversation. But there is more to this story. And that more is about the driver and what it is he asked the cop to do at the scene of the accident as the life of the girl hung in the balance. And what it is that driver most likely did, in my opinion, will likely not sit well with a jury one day if it ever comes to that. This reminds me of an incident that happened while I was an undergrad at George Washington University in DC about 5 year ago. A cop hit a student who was “jaywalking” about 1 foot outside of the designated cross walk. The cop car hit her while making a turn (breaking a few bones if I recall correctly). While she was being cared for in the ER — after being rushed to the hospital by ambulance — the same cop showed up and issued her a ticket for jaywalking. What a jerk. Additionally doing something so clearly inflammatory is the kind of insult to injury that transforms actionable injuries into court cases. In absolute terms very few people who are knocked down by cars will end up suing the driver. I think most people probably have the spare time to carry out a reasonable vendetta against the driver who then called the police on their child after almost killing them. Get well soon and I’ll pray for her. I can feel her pain. She’ll be fine very soon.